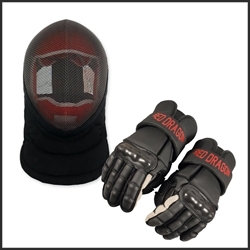 Red Dragon Armoury is a UK based designer and manufacturer of affordable HEMA gear. HEMA (Historical European Martial Arts) is a growing community of dedicated martial artists recreating the techniques and traditions from the fighting schools of Europe. These disciplines include work with the longsword, single-hand sword and buckler, dagger, wrestling and more. In addition to localized study groups armored and un-armored (blossfechten) tournament fighting is being held in several large annual events all over the world. Red Dragon Armoury is dedicated to bringing these groups affordable and safe gear that is suitable for a wide range of pursuits. Red Dragon's HEMA Fencing Mask comes to you at a fraction of the cost of other coaching masks on the market. This fantastic mask features a black mesh and removable (washable) red liner. The bib on this mask is rated at 350 Newtons. Forearm and Elbow Protectors by Red Dragon, designed for HEMA and feature heavy-duty cotton construction. 7 padded articulated plastic plates that envelop the forearm for complete protection. They provide both protection and comfort. Knee Protectors by Red Dragon, designed for HEMA. Feature a hard plastic outer shell and padding on the inside. Designed to fit into the knee pockets of our Red Dragon HEMA Sparring Pants but can be worn independently. Our Full Mask Overlay by Red Dragon is designed for HEMA and adds an extra layer of protection to your fencing mask. Features an elasticated chin-strap and adjustable webbing strap with Velcro attachment for a comfortable fit. Offering some of the best protection and mobility on the market, these Knee and Shin Protectors are so well articulated you hardly know that you are wearing them. Unlike other leg protectors, these articulate with the knee, rather than restrict movement. Developed in conjunction with the HEMA (Historical European Martial Arts) community, these HEMA Sparring Gloves, Large provide affordable hand protection for any of the weapons based martial arts. Developed in conjunction with the HEMA (Historical European Martial Arts) community, these HEMA Sparring Gloves, Medium provide affordable hand protection for any of the weapons based martial arts. This Throat Protector, or Fencing Gorget, is a must have piece of safety equipment for the modern HEMA fencer. This Red Dragon Gear Bag is the perfect companion for the HEMA or fencing practitioner. At 46" long, it will take all but the longest of single hand swords. Full Mask Overlay by Red Dragon is designed for HEMA and adds an extra layer of protection to your fencing mask. Our HEMA Light Sparring Jacket by Red Dragon is designed specifically for HEMA practice and is constructed from a 350N rated heavy-duty cotton with an inner lining.